Turkey vulture soaring on an air current. Note the slight V-shape of the wings. There are two species of vulture in Illinois—the turkey vulture (Cathartes aura) and the black vulture (Coragyps atratus). Adult turkey vultures can be identified by their red, featherless heads. 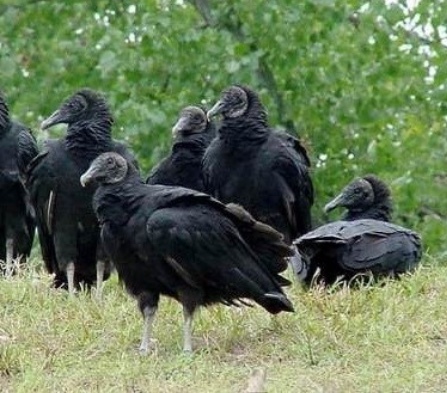 A group of black vultures. The turkey vulture is larger than the black vulture, measuring 26 to 32 inches long with a wingspan of five and half to six feet, while the black vulture measures up to 25 inches long with a wingspan of four and half to five feet. Both vultures have all-black feathers. Turkey vulture adults have a featherless red head; immature turkey vultures have a gray head. Black vultures have gray heads. When flying they can be told apart by the wings and tail. Turkey vultures have black wing linings and silver-gray flight feather and a longer tail. Black vultures have black wing feathers except for the primary feathers (found at the wingtips) which are whitish and shorter tails. Turkey vultures are common migrants and can be found through most of Illinois from Mid-February to mid-November, though some do overwinter in southern Illinois. Black vultures are year-round residents in southern Illinois. They are rare to locally common. Vultures often ride on thermal air currents and groups of them soaring together are called kettles. 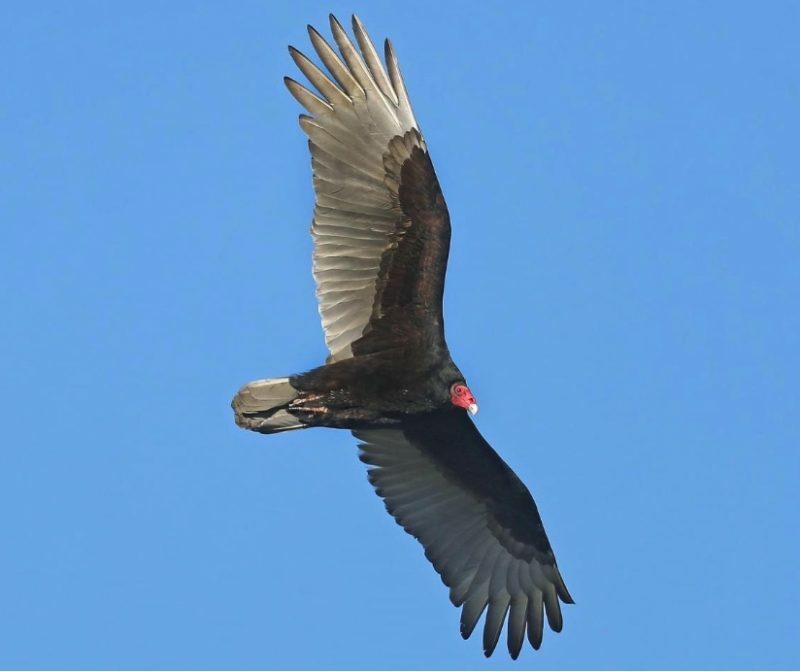 Turkey vultures can be distinguished from black vultures in that they do not flap their wings as often and they hold their wings in a shallow “V” position while soaring. Both species feed on carrion. Because of this, they can often be seen by the side of the road feeding on roadkill. In this way they help cycle nutrients back into the food chain. Vultures can cause health problems when their droppings accumulate. The droppings may contain coliform bacteria which can contaminate water supplies to residences and businesses. Additionally the ammonia odor that emanates from large roost sites can be strong. Vultures can be hazardous to aircraft, especially when waste management facilities or landfills are located near airports. Vultures are prone to being hit by planes because they are slow-moving, not very maneuverable and often soar in flocks. Both species of vulture prefer to search for food over open country. Turkey vultures can be seen along the edges of woodlands, shorelines or roadsides. Black vultures roost and nest in forested areas near water. Carrion makes up the majority of their diet, but both species will take small mammals, eggs, and small reptiles and amphibians. Black vultures are known to prey on young livestock. Turkey vultures nest in hollow stumps, on cliff ledges or abandoned barns or buildings. Both the male and female incubate the two white eggs and feed the young by regurgitation. Black vultures nest on rocky cliffs, tree cavities or abandoned buildings. The male and female both incubate the one to three grayish-green to white eggs with faint reddish-brown or purple blotches. Both parents care for the young. 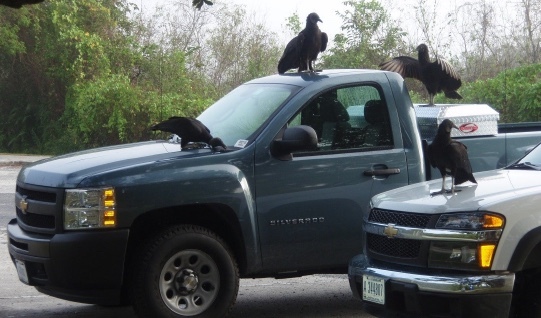 Black vultures can damage paint when they perch on vehicles. When large groups of vultures gather, they can cause several types of property damage to residences and commercial buildings. Both species defecate and regurgitate, which can quickly create unsanitary conditions. When they roost on electrical transmission structures, their accumulated droppings can cause power outages. Black vultures have been known to destroy window caulking, damage roof shingles, vent seals, rubber roof liners and pool covers. They can also damage vehicles by scratching the paint, removing rubber seals or wipers and by puncturing vinyl seat covers. 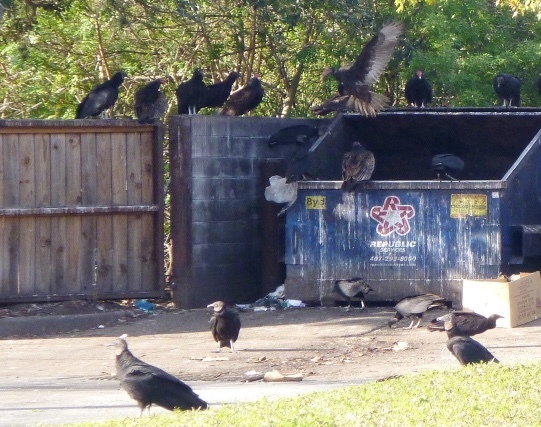 Open dumpsters readily attract groups of vultures. There are currently no proven guidelines on how best to modify roost vegetation to discourage vultures from using a site. It is likely they are attracted to areas due to abundant food sources. Proper disposal of dead livestock, protecting livestock about the give birth and properly disposing of food waste and garbage may make the area less attractive to vultures. Most commercially available bird spikes used for window ledges or roofs are not effective against vultures as they simply stand between the spikes or bend them down. Spikes must be short, sharp, strong and tightly spaced. 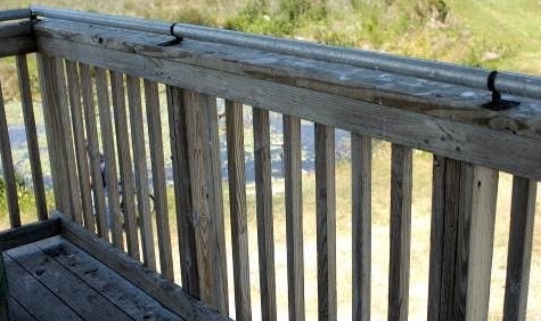 A coyote roller installed on a railing will prevent vultures from perching. CoyoteRoller® is a device that can deter vultures by making it hard for them to perch. This product is most effective on railings or the ridge line of roofs. Electric tracks are available with solar-powered fence chargers so that power outlets are not necessary. These tracks can be built to the desired length and installed on roofs, chimneys or other structures where vultures are roosting. The tracks give the vultures a shock strong enough to convince them to move to another site, but not so strong that it injures the birds. Livestock close to birthing should be kept in barns or buildings that provide protection for them and their newborns. 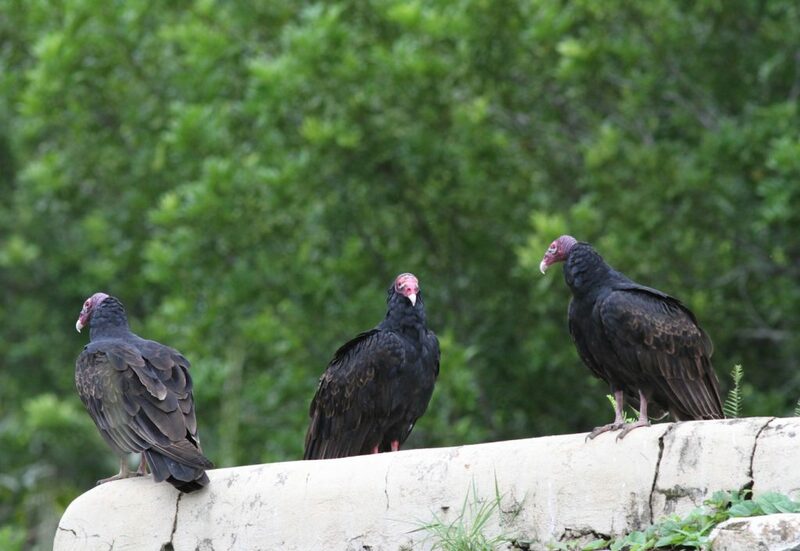 Commercially available turkey vulture statues can be used to disperse vultures from a roost site. An effigy can be a taxidermic preparation or an artificial device constructed to look like a dead vulture. This technique is highly effective at clearing vultures from roost sites if the device is installed correctly and the roost doesn’t include other species. The device must be installed upside down by its feet, far enough from branches or poles to prevent entanglement and located on a high, prominent location. Professionals should be hired to install an effigy on towers. In tree roosts, use a modified bow and arrow rig to launch a line up to the spot the effigy will be placed. If other species such as wading birds, cormorants or anhingas are present, this roost dispersal technique is usually not effective. Both species of vulture are protected by federal and state laws, so it is illegal to possess a carcass without a permit form the U.S. Fish and Wildlife Service. Permits are not needed for effigies made from feathers from domestic waterfowl. 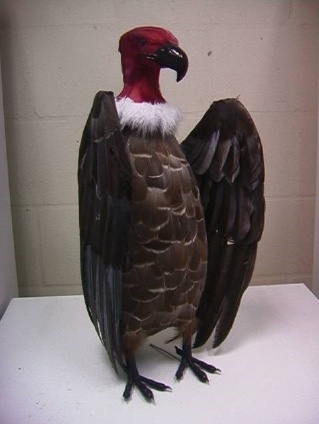 A vulture statue about 16.5 inches tall is commercially available online. Keep in mind that the public may react negatively to an effigy. It is good practice to contact local conservation groups and media sources to explain the purpose of the effigy (humane relocation of the birds) and to assure the public that it is not a live bird that has become entangled. Prior to starting a harassment program, contact USDA APHIS-Wildlife Services to ensure state, county and local ordinances regarding noise and the possession and use of firearms and pyrotechnics are followed. These devices are not typically permitted in residential areas, zoos, parks or business sites. Screamer-sirens and bird bombs can be fired from a 15-mm launcher (starter pistol), shellcrackers can be shot from a 12-gauge shotgun, and electronically generated sounds or propane cannons may also be used where ordinances allow. Some pyrotechnics require a federal explosives permit. Commercial vendors can identify which products require a permit. Helium-filled balloons tethered with Mylar® tape placed in tree roosts can be effective. Birds may become habituated to the balloons over time. Motion-activated sprinklers startles vultures and has been shown to be effective in keeping them from using a site. Vultures are protected in Illinois and may not be removed with a permit. Contact the United States Department of Agriculture APHIS-Wildlife Services for assistance with vultures. The Illinois Wildlife Services office in Springfield can be contacted at (217) 241-6700 or toll free at 1-866-4USDAWS. 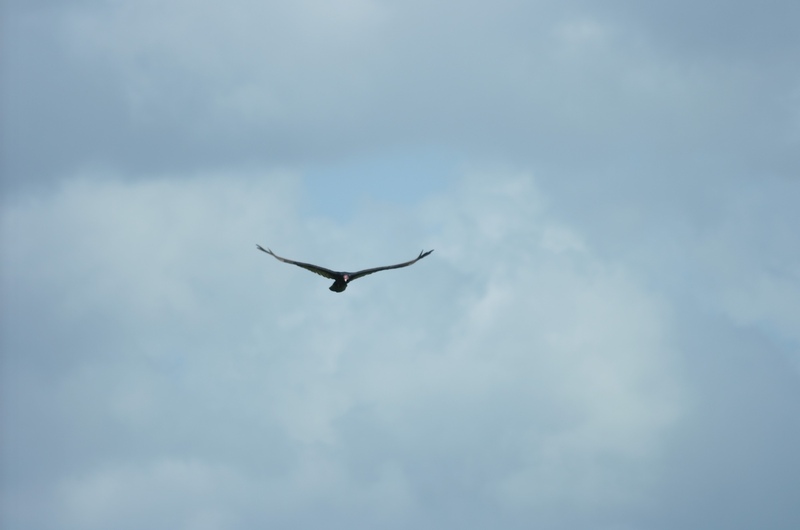 Click HERE for more information from USDA-APHIS-Wildlife Services about dealing with damage caused by vultures. Turkey vultures and black vultures are protected federally by the Migratory Bird Treaty Act and at the state level by the Illinois Wildlife Code. They may be harassed without a permit (unless a carcass effigy is used). They may not be killed without a permit. Illinois Wildlife Services office in Springfield can be contacted at (217) 241-6700 or toll free at 1-866-4USDAWS for assistance with damage caused by vultures.